The conflict between the Northern states, known as the Union, and the Southern states that seceded from the Union and formed the Confederacy, is known most commonly as the Civil War. It is generally known in the South as the War Between the States. Other names commonly heard are the War of the Rebellion, the War of Secession, War for Southern Independence, the War of Brother against Brother and The Recent Unpleasantness. The name Civil War, although much criticized as inaccurate, is the most widely accepted. The name Civil War is misleading because the war was not a class struggle, but a sectional combat having its roots in political, economic, social, and psychological elements so complex that historians still do not agree on its basic causes to this day. What is fact is that in 1861 there existed a situation that had come to be regarded as insoluble by peaceful means. The Confederate States of America, also referred to as the CSA or the Confederacy, was the government which existed between 1861 and 1865 in North America, comprised of states that seceded from the United States of America. The territory of the C.S.A. consisted of most of the southeastern portion of today's United States. Due to claim from the U.S., there was never a definitive delineation of the Confederate States' northern boundary; its southern land boundary was with Mexico. It was otherwise bounded by the Atlantic Ocean and the Gulf of Mexico. The formation of the Confederacy precipitated the American Civil War in 1861, with the vast majority of combat taking place in Confederate territory. 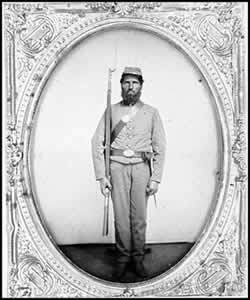 The Army of Northern Virginia, under General Robert E. Lee, also made limited forays onto Union soil. On February 4, 1861, representatives from the 7 states that had already seceded from the United States (Alabama, Florida, Georgia, Louisiana, Mississippi, South Carolina, and Texas), met in Montgomery, Alabama, to form a new republic. On February 8, the convention announced the establishment of the Confederate States of America and declared itself the provisional Congress. The following day, Jefferson Davis and Alexander Stephens were unanimously chosen provisional president and vice president, two men who were moderate enough, it was hoped, to convince the eight other reluctant slave states to join the Confederacy. A committee spent the next five weeks composing a national constitution, which was approved on March 11. The document closely followed the U.S. Constitution, including its Bill of Rights, with a few notable differences. Language promoting "the general welfare" was omitted, while the right to own slaves was explicitly guaranteed, although foreign slave trade was forbidden. Hopes for a nonviolent settlement died after the April 12 attack on Fort Sumter, and more Southern states joined the Confederacy once the war started. Richmond fell to Union forces on April 2, 1865 and the Confederate government effectively collapsed. On April 9,1865, Confederate General Robert E. Lee surrendered to Union General Ulysses S. Grant at Appomattox Court House, thereby effectively putting an end to the Confederacy. The Confederate government in Richmond, Virginia, assumed control over the economic, political, and military life of the South. Eleven states came to constitute the Confederate States of America as their state legislatures or populace voted to secede from the United States of America. Two additional states, Kentucky and Missouri, were admitted to the Confederacy but never formally seceded from the Union. President Jefferson Davis also proclaimed the Confederate Territory of Arizona, which included the southern portions of what are today Arizona and New Mexico. The Confederacy solved the problem of moving mail by creating its own postal service. The C.S.A. 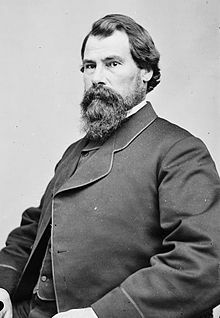 Post Office Department was instituted on February 21, 1861, and John Henninger Reagan of Texas was appointed postmaster general two weeks later. On June 1, 1861, postal service between the warring North and South was suspended. Reagan (at right) was a masterful executive. Under his supervision, the Department actually made a profit. This was an incredible achievement, especially in view of conditions in the wartime South. Even Union officials were impressed. In 1865, after the war had ended, Reagan was asked to assume responsibilities in the post-war U.S. Post Office Department. He declined. In 1861, the postage rate in the U.S. was three cents per piece. When mail service between the North and the South ended, the Confederacy instituted a higher rate, five cents per half ounce on letters traveling a distance of under five hundred miles. This five-cent rate was doubled for distances over five hundred miles. After July 1, 1862, the postage rate was raised to a universal rate of ten cents for all distances. A two-cent rate covered circulars and drop letters. Drop letters were those which were posted, then placed in a post office or "charge box"' for pickup. Few people enjoyed the privilege of street delivery, and citizens almost always fetched their mail from the post office themselves. The vast majority of Confederate covers are addressed to a person in a city with no street address noted. Mail was often addressed in care of a third party. If street delivery was available and desired, an extra charge was added to the regular postage. Three printing processes were employed in stamp production during the nineteenth century: lithography, typography, and engraving. Among stamp-issuing governments, only the Confederate States of America, in the four years of its short existence, employed all three.